Watch This: Did Zimmerman's Lawyer Flee? 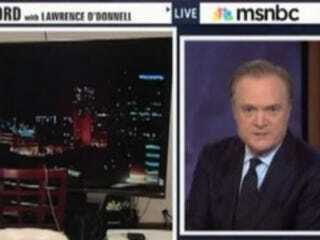 There was an empty chair on Lawrence O'Donnell's MSNBC show Monday night. Why? He said that scheduled guest Craig Sonner — the attorney representing the man who killed Trayvon Martin — fled from the studio, just moments before the show began. Craig Sonner has been the first guest in the history of this particular show, to get scared, to be terrified, so terrified of coming on this show that he has literally run away. He's in our car right now, taking him home from our studio, afraid to face the questioning he would face on this show. Watch out for wherever Craig Sonner shows up next on television, because wherever he shows up next on television has an obligation to put him through serious questioning about what he's doing and what he knows, and the contradictions in the things he's already said on television.